If you would like to show off your beard in the beards of the world gallery, please complete the form below, including at least one good photo. Press “Submit” to send your completed entry. Photo should primarily show your face, including your beard. Photo should be of a good size, preferably at least 300 x 300. Do not submit thumbnail-sized photos. Photos should have adequate lighting and should be in focus. Smoking policy: Photos with pipes and cigars are acceptable, but no part of the face or beard may be obscured by smoke. Photos with cigarettes will not be accepted. By submitting any photo, you certify that you own the rights to said photo and grant permission for its use on the “all about beards” (beards.org) web site. Submitted photos and comments should be in good taste, suitable for a general audience. Keep your language clean! Which of the following best describes you? Check one. Why did you grow your beard? How do you feel about your own beard? Please upload at least one good-quality photo using the buttons below. Be sure to follow the photo submission guidelines listed at the top of this page. The file size limit for uploads is currently 3.0 MB per photo. For larger files, email them as attachments (see below for email instructions). 30 + 60 = ? Submitted photos do not appear immediately in the gallery. I will notify you by email when your entry has been added to the gallery. If you do not receive an email from me, your entry may not have been received. In that case, please resubmit. Thank you. Having trouble uploading photos with this form? If you cannot successfully upload your photos using this form, please copy the questions below into an email message. 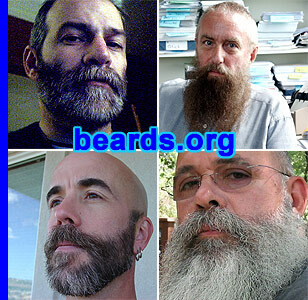 Answer the questions and email your answers along with one or more attached photo(s) of your beard. Which of the following best describes you? Select one. Return to the Beards of the World Gallery.